One thing that has surprised me in this graph is the revelation that the majority of large cities exempt their downtowns from these regulations (although many still require parking for other uses such as housing). Unsurprisingly, the most conspicuous exception, (Edit: 27 July 2013: Thanks to Michael Bates below who pointed out that Tulsa does in fact exempt its CBD from parking minimums) Tulsa, recently won streetsblog’s ignominious “Golden Crater” award. Obviously there can be very different definitions of what constitutes each city’s downtown and so the areas not subject to parking minimums in each city will vary. Clearly, in many of these cities, the relatively small footprint of these exempt areas has failed to achieve the critical mass necessary to create robust transit ridership and fully-functioning pedestrian oriented communities. People need to travel to places outside the central business district in the course of their daily lives. Simply exempting a small area where a large portion of the population works is not sufficient to allow reliable alternatives to the personal vehicle. If transportation choice is not permitted everywhere (or at least in a sufficiently large zone) it will not exist anywhere. It would be interesting to know if higher parking requirements have an effect on the design of office buildings. Since open office designs fit more people than a similarly sized building with personal offices, one might expect to see more open offices in cities with high requirements in order to avoid having more parking spaces than people. I personally like open office environments, but I don’t think that parking should be driving the decision to build them. At this point, a majority of the city by area is subject to Section 151. These districts include most of the city’s residential districts (RH and RM) and the majority of the City’s neighborhood commercial districts. However, these districts don’t permit office development. The only remaining district in Section 151 that permits office is C-2, and most of the remaining C-2 parcels are included in Special Use Districts where the minimum parking requirements are waived, and in the remaining C-2 districts, a waiver from minimums can be granted ministerially. So it’s accurate to say that most housing in San Francisco is still subject to minimum parking requirements (1:1 in most cases), but also that nearly all office development has no minimum requirements. The intent of the map is to show the minimum parking requirement for what would be considered the typical office building in each city. It seems that in San Francisco that minimum is zero. I have updated the graphic accordingly. Additionally I have added a note clarifying that the absence of a light grey bar in the bar graph indicates that no parking is required for office buildings in that city’s downtown. This entry was tagged business, cars, city government, development, infographic, minimum parking requirements, municipal code, office, parking, regulation, sprawl, transportation, unfunded mandate, urban planning. Bookmark the permalink. This is brilliant work – bravo! In working with city parking requirements (as an architect and urban designer) one of the things I’ve found is that cities have no idea how much parking they actually have, how much is already in existence. There is no count of spaces, no data base, and so almost no way to tell whether these parking ratios are appropriate, to measure their impact, or make a case for changing them. 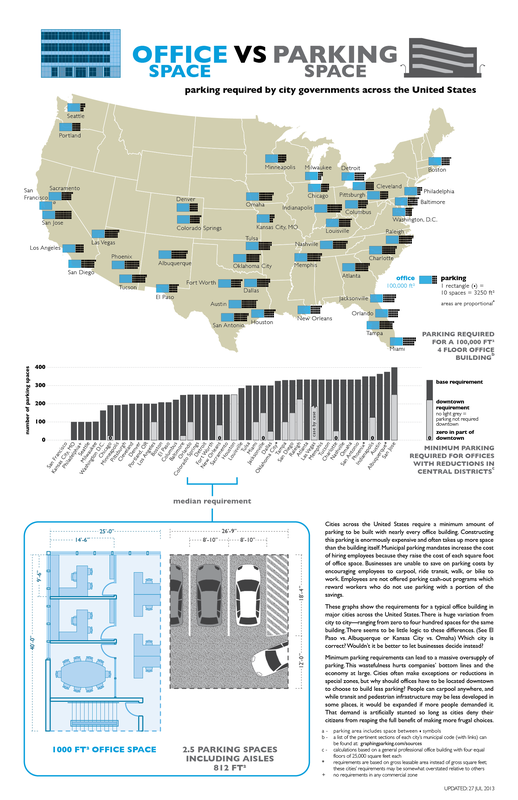 For such a valuable and space-consuming commodity, parking is largely un-quantified. Thanks Jack! The dearth of information and research behind parking policy decisions is a topic I hope to eventually spotlight. Also, I happened to notice that you commented with an FXFowle email address and I hope you don’t mind me saying that I admire your firm’s work. You all have been involved in some really exciting and interesting projects. Keep up the good work! I’ve written a book on how to reform minimum parking requirements that might be of interest. Parking Reform Made Easy is now available from Island Press. But I must admit that your graphics put mine to shame! Well done. Thank you Prof. Willson! It’s an honor to have you comment here. I’m adding your book to my reading list. Also, if you ever wanted to collaborate on a graphic of some sort, I’d be thrilled to oblige. These are excellent graphics. Thank you for compiling this information. A correction regarding Tulsa: There is a hard-to-find provision in section 1200 of the zoning code that exempts the CBD zone from parking minimums. CBD zoning covers most of downtown. Unfortunately, the exemption doesn’t extend to the CH zoning that covers our walkable early 20th century neighborhood commercial districts. Tulsa’s downtown parking crater is not the result of regulatory parking minimums, but perverse tax incentives (cut your property taxes and assessments by removing improvements) and the desire of downtown churches and Tulsa Community College to provide convenient parking for their parishoners / students. Thanks Michael! This was very helpful. I shall revise the graphic when I get the chance. The graphic shows the aisle out to the centerline only. The full aisle would be 24′ wide, but since both sides share the same aisle, only half should be counted as belonging to each side to avoid counting the space twice. Do the parking requirements mandate the spaces be within a certain proximity to the building? Yes, most if not all cities require that the parking be provided on the same site as the building itself, meaning on the same lot. One cannot put the required parking on a nearby property even if it is on the same block or share a parking lot with another building unless the lots are combined and owned by the same entity. Sharing the same parking between businesses with different hours such as a bar and an office is not allowed, each must have their own even if the lots are occupied at completely opposite times of day. This lack of flexibility in how buildings can provide parking forces extremely inefficient and user-unfriendly parking lots in urban settings where there are smaller properties and favors large-scale development over mom and pop operations–shopping centers rather than neighborhood stores. The long skinny lots that once defined urban blocks are now essentially useless and must be combined in order for anything to be built at all. Some cities allow for alternate arrangements to be made, but there is an approval process which costs time and money and has an uncertain outcome. Cities will sometimes dictate that valet service must be provided to the alternate lot. Interesting work and great graphics. I wonder how you might update the ratios considering the trend of moving towards creative offices with more shared open space and activity based workspace design. The impact of higher density office space might make this diagram even more extreme. Also, I’m curious of what may happen if you look at other dedicated spaces (green space vs driveways per workspace). I have an office building, ground + 2 floors, with gross area of 2238 m2 on ground, 1864 m2 on 1st & 2150 m2 on 2nd floor. the building is situated in Riyadh, Saudi Arabia. There is no public transport. each & every individual comes in his own car. The society is build like this. Total estimated population would be around 325 employees, without visitors. how do I calculate the number of car parking spaces please. thanks & best regards. Note: IBC or other international codes wouldn’t work. Thanks for your comment. The short answer to your question is that there is no standard that would allow you to accurately calculate your parking needs. Part of the decision is a value judgment as well as a business decision as with any real estate investment. If you want to ensure that every driver has a place to park for free even in the busiest hour, you will build many parking stalls that sit vacant almost all of the time and are thus unprofitable. This has been the goal in the United States, and it has led to many bankrupted malls in the suburbs. If your goal is to maximize the economic potential of your real estate, then you will build less parking and occasionally some drivers may have to wait at the busiest times. You could also decide to charge for parking which might encourage people to carpool or take a taxi. It is also a matter of predicting the future to an extent. Will self-driving cars make parking lots obsolete five years from now? Will the new metro system be popular and greatly reduce people’s reliance on cars? If so, building a lot of parking will be a wasted investment then, but may have been necessary to the success of the project in the years in between. You are probably best observing how much parking is filled at similar properties in your area and making an educated guess based on those observations.